** Before you customize the member interface note that web site and the mobile app were designed using modern design paradigms that emphasize the produce images and use less colors to create a much cleaner look & feel. Website Main Color - In this property you can adjust the main color of your member interfaces. This color will be applied on buttons, links and other web elements on the web site. The color must be set as HTML color code. See more details below in the color section of the guide. 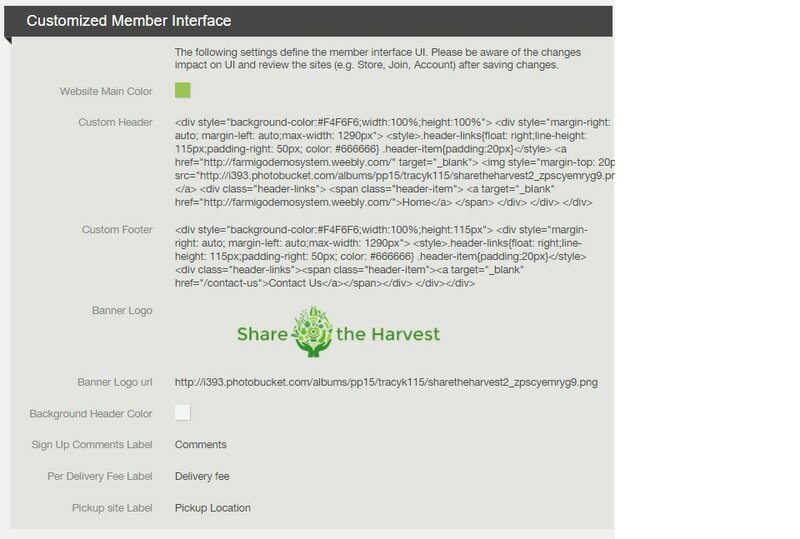 Custom Header / Custom Footer - In this property you can customize the header/footer of your member interfaces. The property must be edited with HTML code. When you set theHeader property it overrides the banner logo and color settings. See more details below in the Header and Footer section of the guide. The buttons color is becomes darker upon hover and click, therefore selecting a very dark color will hide the color animation. Although you can set any color, we suggest to use one of the colors recommended by our design team on the right. To ensure the content of the page is aligned correctly, the content width should not exceed 1290px. The custom custom header code supports HTML scripts. HTML scripts can be used to allow pixel code for facebook tracking, for example. After this tag you can place your script tag and code. For example, you can place the following code at the end of your custom header code.